Ask fellow campers about "Sky City RV Park" and nearby attractions. This stop was a "one-night only" as headed westward along I-40. The campground is all gravel and the view of the mountains is beautiful. A good stop-over spot in the desert. Good water pressure, utility connections and good restaurant. About 1/2 mile walking distance from campsite to hotel lobby/restaurant. We camped at Sky City RV Park in a Motorhome. The restaurant served a mega-buffet and also offered food from the menu. It was good food. Just an overnight stop on our way through on I-40. We parked and walked over to the hotel registration desk, where the girl was friendly and helpful. She gave us the veteran's discount from seeing my husband's hat - we didn't ask for one. Great price for FHU. We signed up for the player's card and got some swag, played for a while after dinner - which wasn't bad - came away from the slots 50 cents ahead, and got a good night's sleep. Can't ask for much more. We would stay here again. We camped at Sky City RV Park in a Fifth Wheel. The casino was ok, dinner in the cafe was ok, slots were ok, found a couple that were fun. Fuel station right there for cars and big rigs. You could also dry camp in the gravel lot for free. 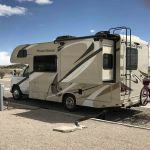 During a blizzard that hit New Mexico, I decided to pull into the Sky City RV Park to spend the night. It was 11:00. The office was dark and closed. There was no directions on where to register. I figured I'd pull into a site and pay the next morning. The next morning, I left the RV park and went to their travel center and bought gasoline. It was still blizzard conditions out. The gasoline was only $1.99/gallon. I asked an attendant on where to pay for the RV park site. They told me the front desk at the hotel across the street. I went there and the front desk clerk said she closed out yesterday's registrations and couldn't add my stay. I suggested that she log me in as an after midnight arrival so she could put it down as a next day's registration so I could pay. For some reason she couldn't do that. She said that she won't charge me for the stay. The park itself, from what I could see of it, as it was dark and covered in snow, was nice and organized with relatively spacious sites. We camped at Sky City RV Park in a Motorhome. The casino has a nice restaurant and breakfast buffet. Nice spot to stop and fuel up and rest for the night. Sites are concrete, level (at least ours was), hook ups worked fine, and a casino to get a bite to eat. The shuttle will pick you up but we just walked over and enjoyed the beautiful sunset. Not necessarily a great place to walk pets as there are stickers and not any grass. Boy dogs shouldn't have a problem but it could be a challenge for the girls if they only "go" on grass. :-) Still a great place to stop and a great price for all you get. I love the desert look and the mountains all around. The sunset was spectacular. Some road noise but if you stay along an interstate it can't be avoided. Not as bad as some though. We will definitely stay here again. We camped at Sky City RV Park in a Motorhome. You have to call for the shuttle after picking your site to pay and get the box unlocked. Very fast though and the people were friendly. The process is a bit of an inconvenience but overall not bad if you are aware of it. Very good fuel prices at this casino too and when you fill up you get 50% off the buffet. At least we did and the food was pretty good, for a casino. This location is a good spot to pull in, recharge your batteries, top off your white tank, and drain your grey, black, and galley tanks. Ground is slanted heavy, after I finish my to-do list I plan on turning around to help in leveling efforts. We camped at Sky City RV Park in a Fifth Wheel. We had a level, gravel, pull through, FHU site with cable TV. Check in is still at the casino. The bathrooms are clean, but the park no longer has an on site laundry facility. I still do not see any recycling. We camped at Sky City RV Park in a Motorhome. 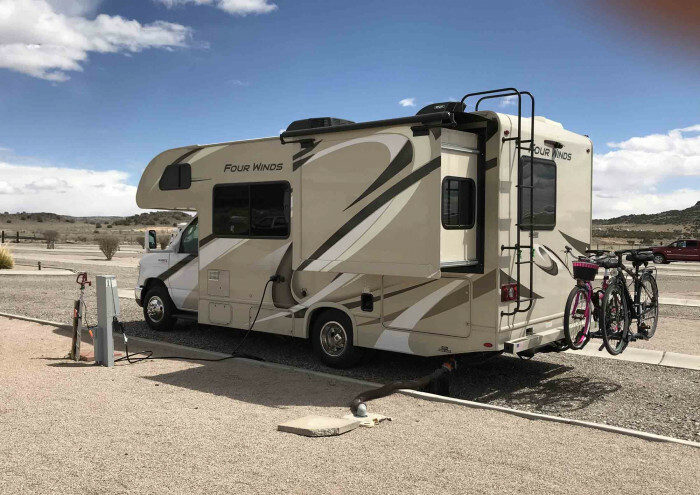 All pull-through sites which are plenty long enough for a 45 foot motorhome plus tow. Electric, water, and sewer hook ups were first rate. Sites are level and separated by a 10' island on each side. Gravel is pea gravel mixed with rounded stone (river stone) gravel which is much easier on your dogs feet! Very clean area. Travel plaza, casino and decent restaurant are part of the complex. Best value at $22. We camped at Sky City RV Park in a Motorhome. This is basically an extension of the casino parking lot. Full hook up for $15 right off the highway. You can't go wrong. Security drives by which is nice. The casino offers a shuttle 24/7 If you don't want to walk 1/2 a block. You can pull in a site and call them and they'll bring out a key to unlock the electric/water and there's a drop box when you leave. We camped at Sky City RV Park in a Motorhome. This is really nothing more than a gravel parking lot. But for $22/nite - who cares. Walk across the street to the restaurant and get some really good food for reasonable prices. Water pressure and cable TV are both okay. We camped at Sky City RV Park in a Motorhome. If possible, take the time to visit the Acoma Pueblo Sky City. It is about 1/2 hour away and well worth the trip. It was a very windy drive so we stopped early. The campground is close to the interstate but you do not hear the noise. The area is desert like so there is no grass but it is attractive and well cared for. The roads and sites are paved and very easy to maneuver even for larger rigs. The sites are all full hook-ups and pull through. The bathrooms & showers were clean and very nice. There was no dog walk but plenty of area to walk your pet. There was a free shuttle to and from the casino, which had a very reasonable dinner menu. Everyone was very friendly. The office graciously provided an adapter for the cable if needed. They also have a travel center with a gas station. This is just 45 miles west of Albuquerque. We stayed in a 28' motor home with a tow. We will definitely stay here again if in the area. We camped at Sky City RV Park in a Motorhome. Large gravel parking area, but sites are plenty wide and long pull throughs. There is a shuttle to the casino, but it isn't a very long walk. We went over to eat dinner at the casino and even though there appeared to be open tables we had to wait for 10 minutes to be seated. Waitress was prompted and friendly and gave good service. Food was okay; husband had the buffet and rated it a 5 out of 10. The other three of us had a meal off the menu; they weren't bad, but not great. For the price I wouldn't probably eat there again. Lots of locals were eating there. The prime rib which was the offering for the night was either well done or barely cooked, extremely rare, bloody. Though the campground is right off the interstate the traffic noise was not noticeable which was a pleasant surprise. This was an easy in and out for an overnight stop with good pricing. $19 plus tax with the GS discount. For full hookups this was reasonable in my book. We would stay here again when traveling along I-40. Sites were level. We camped at Sky City RV Park in a Fifth Wheel. This is one of our favorite places to stop as we are traveling across I-40. The sites are large and if it isn't too busy, the hosts try to skip every other site so you aren't right next to your neighbor. All sites are pull-through for easy parking. There are plenty of good places to walk your dog, too. If you get a player's club card at the casino, you can get discounts on the campground and in the restaurant. We always take advantage of those discounts. AT&T phones, Verizon MiFi and Dish satellite all work very well here. We camped at Sky City RV Park in a Fifth Wheel. 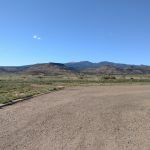 Clean and convenient RV park with all pull thrus along I40 west of Albuquerque. Park is situated in back of the Casino far enough that road noise was tolerable. There are nice views of the mesas as well. This is an exellent deal with the regular price at $22 per night. Beautiful clean and spacious showers and bathrooms. There is a shuttle via Casino security from RV to Casino. We used the shuttle to eat at the casino restaurant, good food and decent prices. RV guests may use the hotel pool and hot tub which were also quite nice. Truck stop adjacent for gas and diesel and a McDonalds there as well. Only downside is the WiFi was weak but Verizon service was good. We would definitely stay again if in the area. We camped at Sky City RV Park in a Motorhome. We saw highway signage promoting $22 overnight w/FHU and drove extra miles to reach this Casino and enjoy their FHU w/very reasonable rate. FAR superior to Casino (Route 66 RV Resort!) 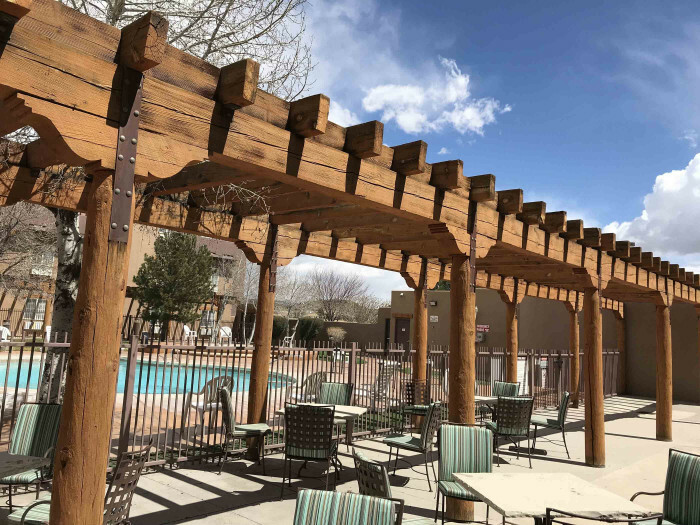 east nearer Albuquerque asking $55 per night for back-in. Friendly, accommodating check in. We camped at Sky City RV Park in a Motorhome. Adequate for one night, level, quiet, friendly staff, security patrol, shuttle to the casino which has good food at a reasonable price. We camped at Sky City RV Park in a Motorhome. This is a casino park, no frills. Lower your expectations if you pay for the Acoma Pueblo tour. The only thing aroud is the casino that has at least one good restaurant. The truck stop has easy access. Visit the nearby (35 miles) Sky City, but note that during the winter months it is only open for visitors on weekends. We didn't know this, and we went there on a weekday. Make sure to join their players club before you pay so you get the discount. There is a full service restaurant in the Casino - hotel and a McDonald's across the street in the gas station. About a 1/2 mile from the interstate so the noise isn't too bad even though there is lots of traffic. Casino with buffet. McDonalds within walking distance, also travel center with some groceries. Sign up for players card prior to check in, you will get the preferred rate. Buffet food was good, but very small selection and they are slow to refill. .Walmart 1/2 hour West. Fuel (diesel/gasoline) available. Lot of commeercial truck/trailer. Mickie Dee's on site also. Unless you gamble, the only thing worth seeing is Acoma Pueblo, which is fantastic! Acoma Sky City tour is a must. Friendly local artisans, Museum at Visitors Center. Our second visit, just as good as the first. 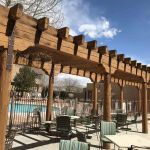 Good location for day trip to El Morro National Monument, El Malpais National Monument and Albuquerque. Daily two dollar off buffet coupon available with Players Card. All casino and restaurant staff were very friendly and helpful. Shuttle available to and from casino. Acoma Pueblo worth a visit if you're into Native American points of interest. Enjoyed the guided tour. 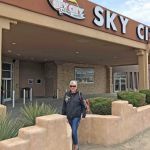 The Sky City on the Reservation is a must see. 100's years old and still inhabited. Great tour. Visit Acoma Pueblo - spectacular! Walk across the street to the Casino for a meal. The night we were there was "Steak" night. Unlimited steak buffet, salad, desert and non-alcoholic drinks for $13.99. Really great food. Other nights are "Prime Rib" night. Casino within walking distance and make sure you get your card as you get discount on buffet. If you are new member, you do get some play money from the Casino. Be sure to to do the Acoma village tour! 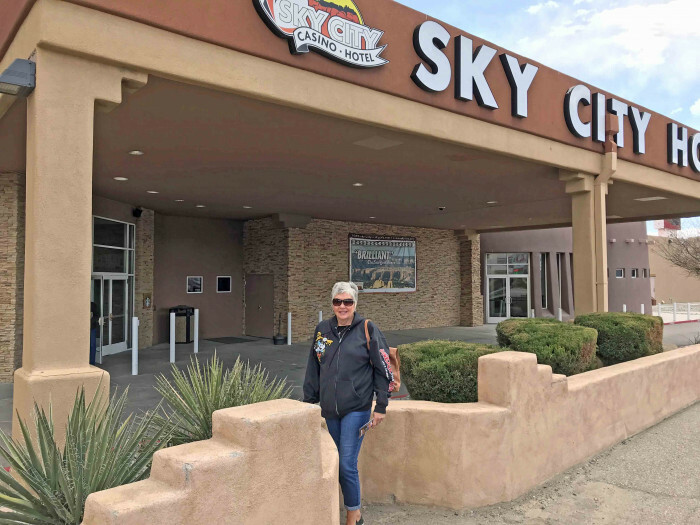 Are you affiliated with Sky City RV Park ?